Comfort and Security for your passenger! BP-TR-S: The comfort and luxurious feel of a wraparound seatback without a tour-pak. 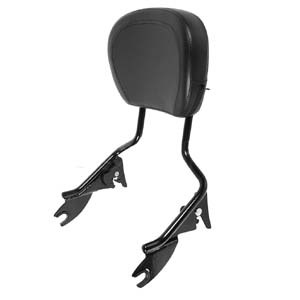 Touring style Package includes Detachable Sissy Bar in black and Touring Backrest Pad. Fits 2009 to current Touring Models. Includes standard height Sissy Bar. Pad Measurement: 23.95 wide x 12.39 tall x 8.83 deep. Does not include docking hardware. BP-TR-P: The comfort and luxurious feel of a wraparound seatback without a tour-pak. 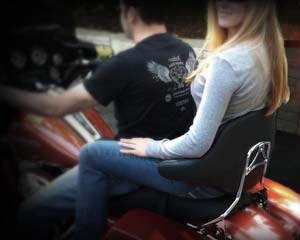 Touring style Package includes Detachable Sissy Bar, Touring Backrest Pad and Docking Hardware. Fits 1997 to current Touring Models. Includes standard height Sissy Bar. Pad Measurement: 23.95 wide x 12.39 tall x 8.83 deep. SP-HW: Give your passenger peace-of-mind while adding form and function with our Shorty Sissy Bar for any '09 - current Harley Touring model. 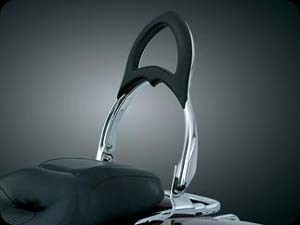 Adds much needed triple chromed passenger backrest to your Road King or Street Glide or Electra. Detachable, rigid, and increases passenger comfort. SB-100: Backrest and Pad combination. Fits '09-'13 Touring models (except FLHTCUSE4/5/6/7/8, FLTRUSE and Trike) equipped with required Docking Kits. FLHTC, FLHTCU, FLHTK and FLTRU require separate purchase of Detachable Tour-Pak® Rack Kit. Requires separate purchase of Docking Hardware Kits for MY '09 to '13 (see our Tour-pak Racks Accessories page). 18.6" tall, from the first mounting point to the top of the pad. Pad size: 13.5"x 10" soft cushion w/ molded ABS plastic backing. Triple dipped Chrome finish. Special order item. 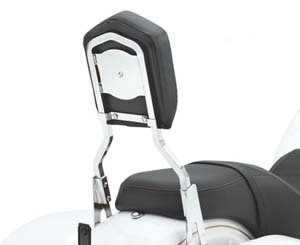 SP-90: Backrest and Pad combination for earlier model years. 17" tall backrest (bottom of the plate to top of the pad), 17"x10" Thick Cushion Contour pad. Fit: '97-'08 Road King®, FLHT, FLHX and FLTR models equipped with required Docking Kits. Fits: '06-'08 FLHTC models equipped with our Detachable Tour-Pak™ Rack Mounting Kit HD-303 and our Docking Hardware Kit P/N HD-803. Fits: '94-'96 FLHR and FLHT models equipped with Docking Kits. Requires separate purchase of Docking Hardware Kit. Special order item. SB-SWB: Give your passenger additional back support with Sissy Bar Upright, backrest Pad, Side Plates and Docking Hardware in one package. 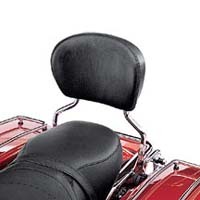 Standard sissy bar upright provides ample back support. Square upright provides a flat surface that is ideal for displaying self-adhesive medallions or round upright features a mini medallion bar and an embossed Bar & Shield insert. Fits '12 to current FLD Switchback. SB-998: Here's the easy solution for the rider who carries a passenger but doesn't like the look of conventional side plates. The Plug-N-Play bolts to the rear fender underneath the passenger seat. The mount accepts the custom Sissy Bar & Backrest Pad for passenger comfort & convenience. 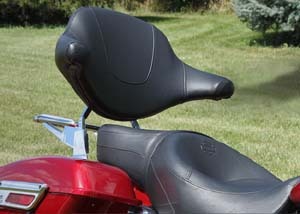 The backrest & pad measures 6-1/2" wide & 9-1/2" high from the rear fender. Fits: H-D Models with 130mm, 140mm, or 150mm Rear Tires (Softail, Dyna, Sportster, FXR). 1606: Backrest with hidden fold-down luggage rack. The sweeping oval bars with matching contoured pad flows with the lines of your bike. Literally fold down the inconspicuous luggage rack right out of the backrest when needed, & hide it away securely with the integrated thumb nut when you don't. Your passenger is happy, you can always bring your things, & your bike looks awesome. Mounts directly to the required Quick Detach Side Plates and Quick Release Attachment Kit & you'll have everything you need. 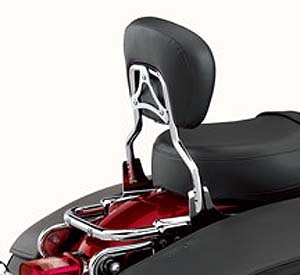 Note: 1606 Backrest, Quick Release Side Plates, and Attachment Kits are sold separately. Review List below carefully and order both items listed for your particular application. 1634: Quick Release Side Plates for MY '09 to '13 for Electra Glide Standards, Road Glides, Street Glides & Road Kings. 1636: Same as above for MY '94 to '08. 1635: Attachment Kit for 1634. 1637: Attachment Kit for 1636. 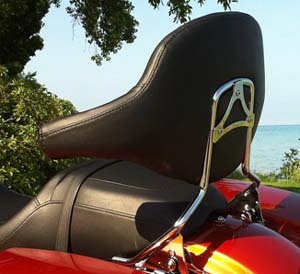 All HD line of backrest and pads are custom Special Order. Pads are sold separately from the sissy bars. 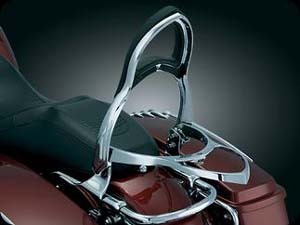 SB-610: Detachable Passenger Sissy Bar Upright - Short, Chrome. 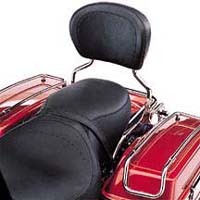 The ideal match for Low-Profile® Custom and Badlander® seats, this backrest is 2" shorter than the standard height upright. The one-piece upright accepts Short Backrest Pads (sold separately), and features easy on-and-off detachable convenience. Requires separate purchase of Docking Hardware. Fits '09-later Road King®, FLHT, FLHX, FLTRX and FLTR models equipped with required Docking Kits. Also fits '09-later FLHTC, FLHTCU and FLHTK models equipped with Detachable Tour-Pak® Rack Kit HD-246. Special sale order. Special Order item. 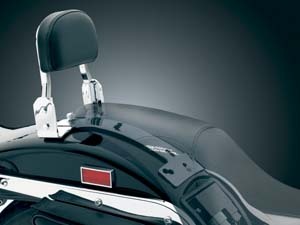 SB-935: Same as above but fitment for '97-'08 Road King®, FLHT, FLHX and FLTR models equipped with required Docking Kits. Fits '06-'08 FLHTC models equipped with Detachable Tour-Pak® Rack Kit HD-303 and Docking Hardware Kit HD-803. Special sale order. Special Order item. 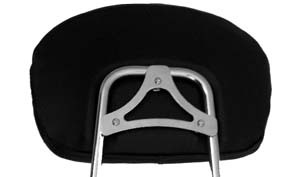 SB-627: Designed for the long haul, this standard-height sissy bar accepts a wide range of passenger backrest pads for customizable comfort. 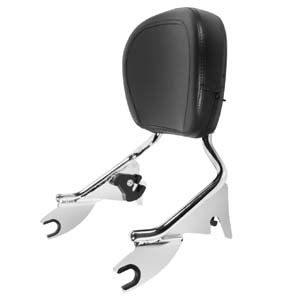 This detachable backrest can be installed or removed in seconds, adding versatility and style to your Touring model. Requires separate purchase of Docking Hardware. Fits '09-later Touring models equipped with required Docking Hardware Kits. '09-later Touring models equipped with rigid-mount Tour-Pak® luggage require purchase of appropriate H-D® DetachablesTM Tour-Pak® Conversion Kit. Special sale order. SB-805: Similar to above but for fitment '94-'96 FLHR and FLHT models equipped with Docking Kits. Special sale order. 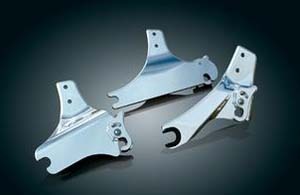 SB-933: Similar to above but for fitment '97-'08 Road King®, FLHT, FLHX and FLTR models equipped with required Docking Kits. Fits '06-'08 FLHTC models equipped with Detachable Tour-Pak® Rack Kit HD-303 and Docking Hardware Kit HD-803 . Special sale order. 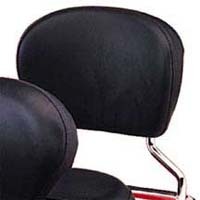 SB-723: Detachable Passenger Sissy Bar Upright - Tall ('97-'08 models). 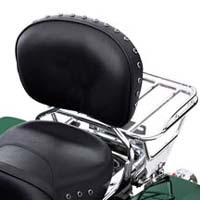 The perfect complement to touring seats with large passenger pillion area, this brilliant, chrome-plated backrest is 2 1/2" taller than Passenger Sissy Bar SB-933. 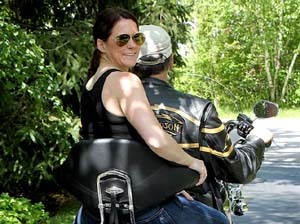 The Tall Upright accepts most touring model passenger backrest pads and features easy on-and-off Detachable convenience. Requires separate purchase of Detachable Docking Hardware HD-803. 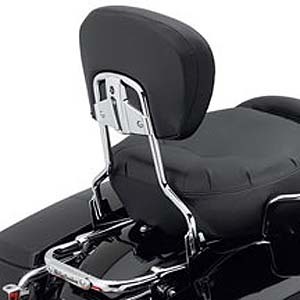 Fits '97-'08 Road King®, FLHT, FLHX and FLTR models equipped with required Docking Kits. Fits '06-'08 FLHTC models equipped with Detachable Tour-Pak® Rack Kit HD-303 and Docking Hardware Kit HD-803. Special sale order. 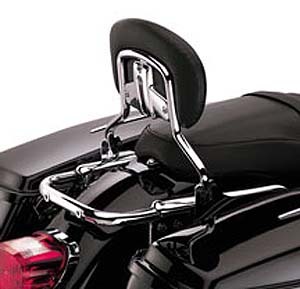 SB-247: Detachable Passenger Sissy Bar Upright - Standard-Height, Gloss Black. 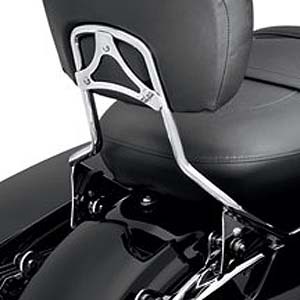 Designed for the long haul, this Standard-Height Sissy Bar accepts a wide range of passenger backrest pads for customizable comfort. 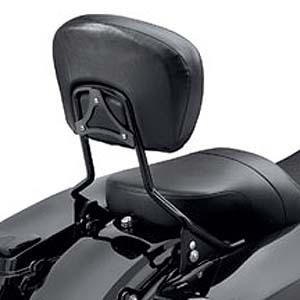 This detachable backrest can be installed or removed in seconds, adding versatility and style to your Touring model. Kit includes gloss black backrest pad bracket. Requires separate purchase of Docking Hardware. Fits '09-later Road King®, FLHT, FLHX, FLTRX and FLTR models equipped with required Docking Kits. Also fits '09-later FLHTC, FLHTCU, FLHTK and FLTRU models equipped with Detachable Tour-Pak® Rack Kit HD-246. Special sale order. 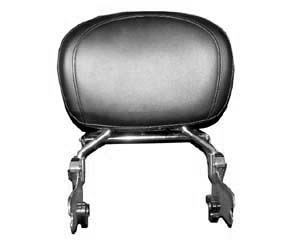 All below backrest pads are customer special order. BP-TR2: The comfort and luxurious feel of a wraparound seatback without a tourpack. Touring style backrest pad. 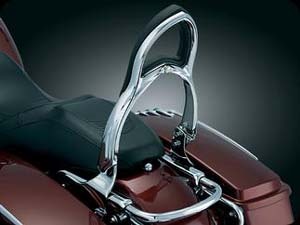 Fits 1994-1996 FLHR and 1997 to current Touring Models with standard height or tall Harley Davidson® Sissy Bars. Measurement: 23.95 wide x 12.39 tall x 8.83 deep. Also fits Harley Freewheeler Trikes. BP-TRS: The comfort and luxurious feel of a wraparound seatback without a tourpack. Touring style backrest pad. Fits all Sportster, Dyna, and Softail Models with the Square Bar, Low, Medallion Style upright. BP-633: Styled to match the MY '06 - '10 Street Glide® model. Large backrest area is great for long touring. Contoured pad provides low back support. 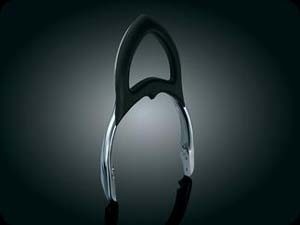 For bikes equipped with Detachable Sissy Bar Upright. BP-408: Sized to complement low profile® custom seats, this compact leather backrest pad combines passenger support with custom compact style. The leather cover with smooth insert complements both synthetic and leather seating surfaces. 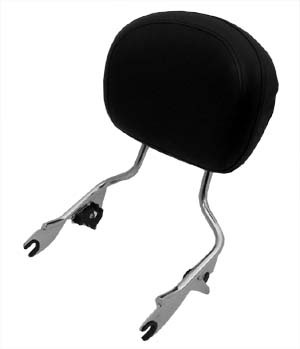 Pad easily mounts to Detachable Short Sissy Bar Upright and the kit includes a styled backrest mounting plate. Fits '97-'08 Touring models equipped with Detachable Short Sissy Bar Upright, SB-935. Will not fit with tall passenger pillion seats. BP-727: Styled to match the smooth cover and stitch pattern of the Comfort Stitch Seats and Rider Backrests, this contoured pad can add hours of passenger comfort. Fits '94-later Touring and Trike models equipped with a Detachable Sissy Bar Upright or Luggage Rack. 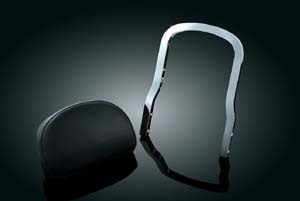 BP-579: Short Passenger Backrest Pad - Smooth Look. Smooth cover complements the Badlander® Seat, Custom Collection and Low-Profile seats. The slim profile allows additional passenger room, and the low overall height continues the long and lean profile of your custom Touring bike. 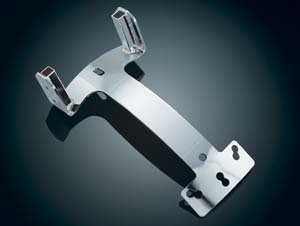 Easily attaches to Detachable Short Sissy Bar Upright with chrome mounting bracket (included). Fits '97-later Touring models equipped with Short Detachable Sissy Bar Upright. Will not fit seats with tall passenger pillion pads. 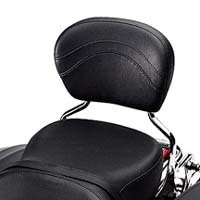 BP-657: Passenger Backrest Pad - Custom Stitching. Styled to match Road King® Custom models, the large backrest area is great for long touring. The contoured pad shape provides additional low back support. Fits '94-later Touring and Trike models equipped with Standard Height or Tall Detachable Sissy Bar Upright or Luggage Rack. 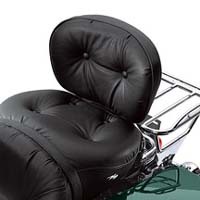 BP-708: Passenger Backrest Pad - Pillow Look. 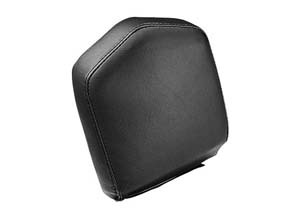 This large backrest pad features a generous radius for increased passenger comfort. Fits '94-later Touring and Trike models equipped with Standard Height or Tall Detachable Sissy Bar Upright or Luggage Rack. 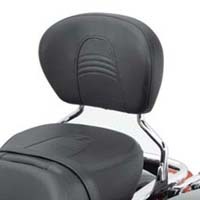 BP-886: Passenger Backrest Pad - Smooth. Large backrest area is great for long distance touring. Contoured pad provides low back support, and the smooth top-stitched pad compliments most seating surfaces. Pad height 9"; width 13.5". Fits '94-later Touring and Trike models equipped with Standard Height or Tall Detachable Sissy Bar Upright or Luggage Rack. 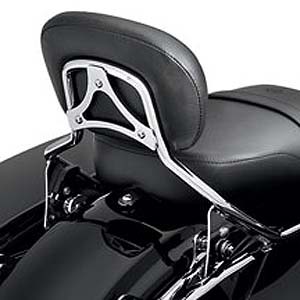 BP-709: Passenger Backrest Pad - Studded. 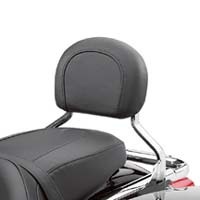 This large backrest pad features a generous radius for increased passenger comfort. Studded styling matches Road King® Touring Seat and stock Road King® seat. Fits '94-later Touring and Trike models equipped with Standard or Tall Detachable Sissy Bar Upright or Luggage Rack. 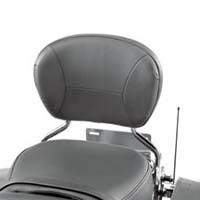 BP-924: Passenger Backrest Pad - Top-Stitched Compact. Styled to match Road King® Classic and Road Glide® models. Fits '94-later Touring and Trike models equipped with Standard Height or Tall Detachable Sissy Bar Upright or Luggage Rack. 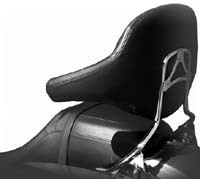 BP-920: Passenger Backrest Pad - Leather Low-Profile. Styled to match Leather Low-Profile Bucket Seat. Fits '94-later Touring and Trike models equipped with Standard Height or Tall Detachable Sissy Bar Upright or Luggage Rack. 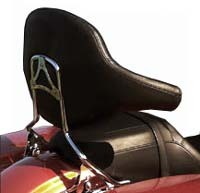 BP-555: Passenger Backrest Pad - Studded. 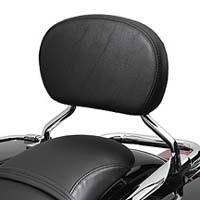 This stylish Backrest Pad is accented with decorative black studs and an embroidered Road King® V-Logo. 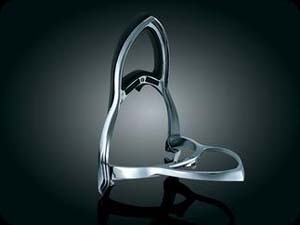 Chrome-plated mounting bracket and chrome hardware are included. Fits '94-later Touring models equipped with Standard Height or Tall Detachable Sissy Bar Upright or Luggage Rack.